As the smallest raptor in Africa—adults are about the length of a sharpened pencil—this species is a fearless hunter and courageous nest defender. The African pygmy falcon is small but mighty! (And super cute.) They form interesting living arrangements: rather than construct their own roost, they prefer to take over a few chambers of a spacious, communal weaver bird nest. With their hunting prowess, the pygmy falcons are beneficial nest guests, cutting down on snakes and other predators in the area. There are two two species of pygmy falcon: the white-rumped Polihierax insignis and the African P. semitorquatus. The latter species is at the San Diego Zoo and the Safari Park. Feather accents. Unlike most other raptor species, these pint-sized predators exhibit sexual dimorphism—males and females have different markings. Females sport a snappy chestnut brown mantle between the wings, while males stick with a solid gray back. Flight feathers are black, with spots and white tips. They have a gray head, dark brown eyes and light orange legs and feet. Its underbelly is creamy white. It has a small, sharp beak and orange rings around its eyes. It is striking even as it swiftly strikes its prey on the ground from a perch. They have been known to hunt and catch insects in flight. The pygmy falcon’s wingspan can exceed 14 inches (37 centimeters)! Some like it hot. Native to Africa, these birds thrive in arid and semi-arid steppe regions with sparse ground cover and scattered large trees or good-sized aloe plants. The birds need to see potential prey on the ground, but have a safe perch from which to nab a meal. Shhhh, I’m hunting. When pygmy falcons spot a tasty target, they often bob their heads and tails before swooping in for the kill. These fierce predators take mostly lizards and large insects, as well as small rodents, birds, and other arthropods. Occasionally, they will take a host weaver adult or chick. They usually hunt from a perch and catch their meal on the ground. Move over. 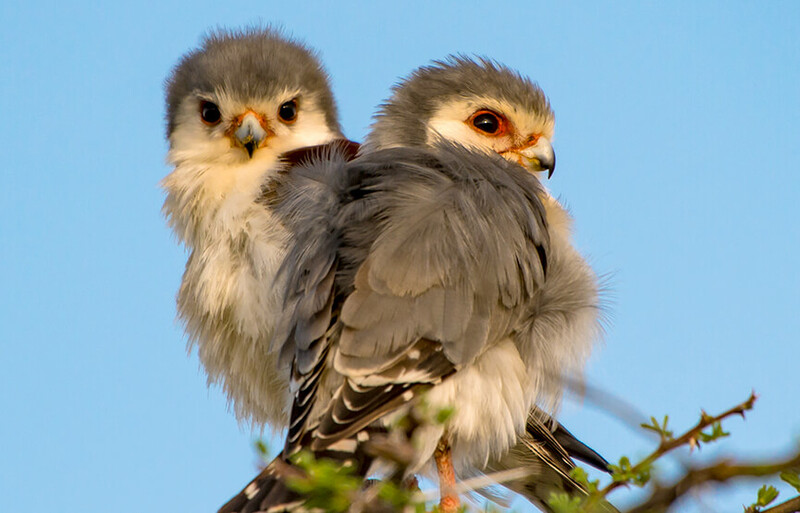 African pygmy falcons rely on weaver bird nests for their roosting and nest sites, especially sociable weavers in South Africa and white-headed buffalo weavers in northeast Africa. They also hole up in the nests of sparrow-weavers and glossy starlings. Pairs and their chicks roost together in the same weaver nest chamber until the young move on. 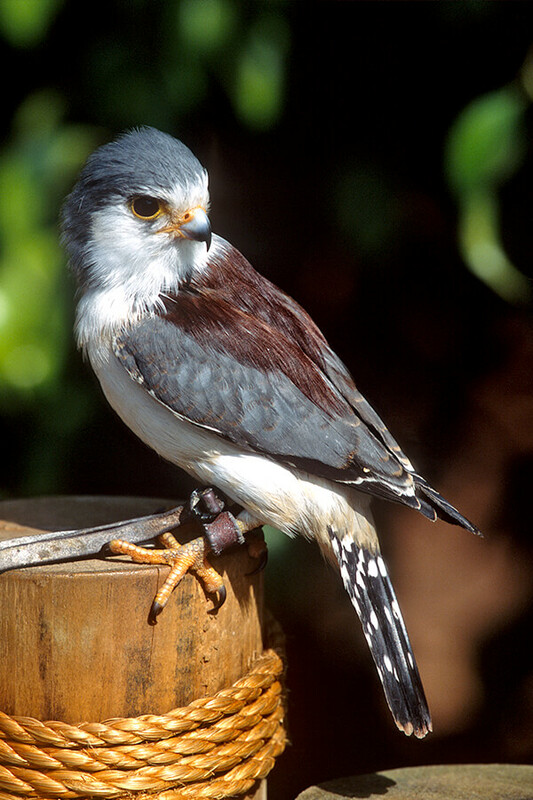 The African pygmy falcon prefers larger weaver nest masses, occupying 12 to 25 percent of nest masses available. It uses up to six chambers for its nests. Hanging out. This little falcon is mostly a resident where found, but there is some local movement in drier parts of its range—they head to moister habitats when needed. It is confined to its nest chamber for up to 15 hours a day during the chill of winter, “with moderate hypothermia” as the Handbook of the Birds of the World points out. Nothing to see here. Though small, these falcons will bravely chase off predators larger than themselves, especially if they are protecting eggs or chicks in the nest. Hear me, see me. Songs sung during breeding time attract potential mates. Bodily communication like head bobbing and tail feather raising also convey important information. Occasionally males are heard to make a “thin, squeaky” call to a female; youngsters make a sharp ringing sound when threatened. It’s a family affair. According to some scientists, females occasionally breed with multiple males (polyandrous) and it is not uncommon for two or more males to attend the same nest. This behavior may reflect a shortage of suitable nesting sites. The female lays her eggs between June and December in northeast Africa, and August through March in South Africa. Double clutching is not uncommon in favorable years. Calling, head-bobbing, and bowing displays, with tail-pumping for good measure, increase prior to nesting. The female will squat down and raise her tail feathers to her chosen one(s); eggs are laid a short time later. The pair occupies a weaver nest chamber, with the lip of the entrance becoming coated in white droppings that turn pink over time. The falcon’s eggs hatch after about a monthlong incubation period. Hatching is asynchronous, so youngsters may be different sizes. Chicks have fluffy white down feathers and fledge at 27 to 40 days. Youngsters stick around the parental nest about two months after fledging. Our animals. There is an ambassador African pygmy falcon at the Zoo, and there are two ambassador birds at the Safari Park. There is a breeding population at the off-exhibit Avian Propagation Center at the Park, as well. Living large. Having a broad range and flexible diet helps the African pygmy falcon survive. As long as its habitat persists, so will this mighty hunter. Currently, this species appears to be stable. 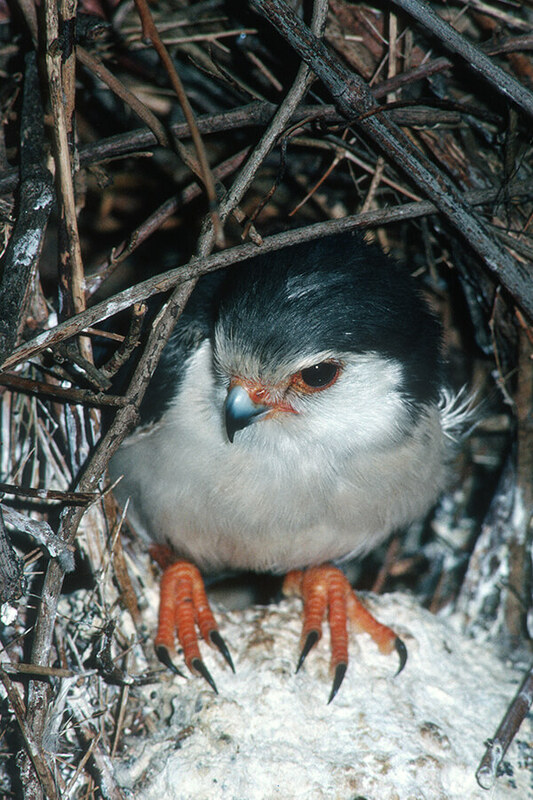 Pygmy falcons inhabit about a quarter of all weaver nests; it is one of the few “obligate nest pirate” species. Like most diurnal birds of prey, pygmy falcons have a keen sense of sight. This bird has an undulating flight pattern with bursts of rapid wing beats, with dips and glides in between, much like woodpeckers.